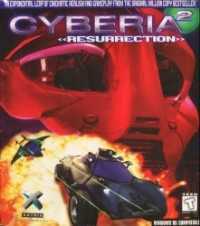 The original Cyberia was a rail shooter that combined adventure game elements with Rebel Assault style action sequences. Cyberia 2 is essentially the same, except the 3D rendered graphics have been improved, and the quantity of in-game movies has been increased. It continues the story of the first - after destroying FWA leader Devlin and his orbital headquarters, Zak and the Cyberia weapon crash land back to Earth, where they are picked up by an FWA team led by the maniacal Dr. Corbin who sticks Zak in cryo-storage and uses the remains of the Cyberia weapon to create a doomsday virus known as nano-toxin. His FWA employers want the nano-toxin to put down a growing rebel movement, but Corbin intends to use it to kill millions and "reshape the world as we know it". Three years later Zak is thawed out by a renegade FWA Major, and together the two of them have to find Corbin and stop his Sinister Plan. Also, it turns out that Zak's mutated tissue can now be used to recreate the ultimate weapon in unlimited supply. Zak must blast guards, ATVs, hovercraft, in some spectacular arcade sequences. Your rapid-fire aim will be put to the test as you take out enemy vehicles while coping with such obstacles as bumpy roads and barrel rolls, all created with mind-bending detail. During an especially outrageous battle while hovering above a high-rise tower, taking out a few sides of the building along with FWA jets makes for some striking scenery. When not picking off the FWA's jack-booted thugs, Zak must solve a variety of puzzles that will short-circuit the regime's plan. These logic problems range from simple to very complex and, in many cases, if they're not correctly executed you will be. Fortunately, the shooting is less difficult this time (probably Xatrix got too many complaints from gamers who blistered their knuckles or broke the joystick in frustration), although you still cannot save anytime you want.